Ensuring there are no awkward moments this December, Disney continues to introduce characters from its upcoming Rogue One: A Star Wars Story well in advance, sending everyone photos and brief bios beforehand like a college welcoming its incoming freshmen. That way, when you enter the theater for orientation, you already know who’s a droid, who’s into assassinating, who’s into death trooping, etc., and no one has to waste any time on the clumsy, getting-to-know-you small talk of narrative exposition. Disney already knows you guys will be the best of friends. Unveiled at San Diego Comic-Con, then to the outside world via the Star Wars Facebook page, Edrio is said to be a “mercenary pilot who flies alongside his eggmate, Benthic.” What’s an eggmate? We don’t know. Presumably it’s an egg with whom one has forged a deep and lasting bond, or it’s someone who happens to share your egg. Maybe you went to high school with your eggmate, and after you graduated to the big, scary universe, you thought you may as well share an egg together. Maybe you were just randomly assigned an eggmate by Egg Housing using one of those arbitrary algorithms—you both said you “like movies” and are non-smokers, which to those idiots means you must be perfect eggmates. Those guys don’t care. Or maybe you found your eggmate on Craigslist and you don’t really speak to each other except through strained pleasantries and the occasional passive-aggressive conversation about the kitchen. Regardless, isn’t Edrio getting a little too old to have an eggmate? After a certain point, it just feels like you’re avoiding being alone with yourself. Anyway, what other column-filling claptrap can we extrapolate from this promotional dummy of a tertiary character from a movie franchise? He’s a friend of Saw Gerrera, Forest Whitaker’s Rebel extremist, and he probably has similarly X-treme views about getting his revenge against the Empire. 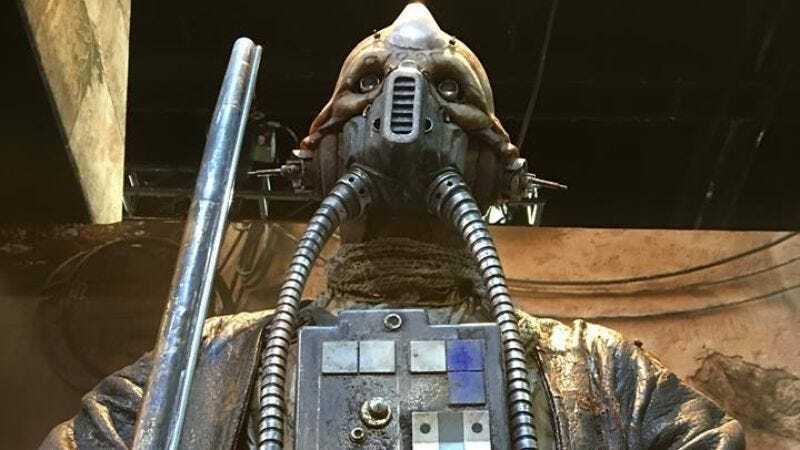 As /Film suggests, it looks as though he’s cobbled his outfit together from various leftover Star Wars costumes—a TIE Fighter pilot’s chest-box thing here, a Tusken Raider rifle there. He has hints of both Guardians Of The Galaxy’s Star-Lord and Mad Max: Fury Road’s Immortan Joe. His little petticoat has pretty ruffles. And he’s got those tubes—two of them. Sure, maybe the nickname started out as a joke (“Hey, here comes ol’ Edrio Two Tubes! You sure do like them tubes, huh? Hey, why don’t you leave some tubes for the rest of us and quit hogging all the tubes? You know, I was just telling my eggmate the other day that we should go out and get some tubes, but then he was all, ‘Edrio already took ’em all!’ And that was all he said for the rest of the day. Just clammed right back up like he always does. You know, it’s like, we share an egg, but there’s this huge chasm between us that I can’t ever seem to bridge. I mean, we don’t have to be best friends or anything—I know he’s got his own life—but still. We spend all this time together inside the egg, and I still don’t know anything about him. It’s like living with a total stranger. Sometimes I think I should move out and get my own egg … but then I’d probably just be even lonelier. At least this way I have someone there in case, I don’t know, I fall in the shower or something, you know? Like, what if I fell in the shower and broke my neck? No one would find me for weeks! They wouldn’t even know until the mail started piling up—or God, if the egg started to smell and the neighbors complained. And then the landlord would have to let the cops in, and… Jesus. No, it’s just better to have someone there, even if that someone is just an eggmate who happens to share your space solely for convenience’s sake. Right? Anyway, nice tubes! Hey, I gotta another tube for ya right here!”), but it’s nice to see that Edrio just decided to own it. Anyway, you’ll get to see Edrio Two Tubes lurking in the background of a couple space war scenes this winter.